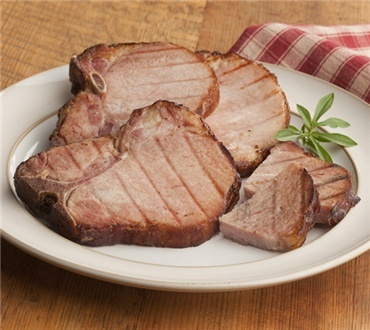 We hand cut these beauties form the heart of select, cob-smoked pork loins. Sweet, moist and full of flavor...worlds apart from the ordinary store bought variety. Fully cooked, just warm and serve for unbeatable texture and flavor. These Pork Chops were delicious. I especially loved that they were cut thin. They had no fat on them and took two minutes in a pan to heat, My husband who is very picky about pork, tried them and said "reorder these right away". ALLREADY COOKED,JUST HEAT N EAT COLOR ON GRILL LOW HEAT OR PAN FRY VERY TENDER AND TASTY PRODUCT IF YOU LIKE HAM YOULL LOVE THEESE. The chops are good anytime and easy to store and prepare. I have ordered these chops before and they are always delicious! I have served these to company and they are so impressed that they have asked me for Dakin's phone number, so they can also order. Would like them a bit thicker cut, but really good flavor and tenderness.